For Volume 25 of 'The Romantic Piano Concerto' Hyperion went to Portugal to celebrate one of the country's greatest musical sons. José Vianna da Motta, if he is remembered at all, is primarily known as a very fine pianist. He was one of Liszt's last pupils, became a friend of Busoni, and left a small body of very impressive 78rpm recordings. After many years based in Berlin he returned to his country of birth as director of the Lisbon conservatory and became central to the musical life of the country. And like many other performers of the day, he also composed. Though he later went on to compose songs, chamber works, and a symphony, both his works for piano and orchestra are early works and were never published. Indeed the A major Concerto was never performed in Vianna da Motta's lifetime and the world premiere was given by the forces assembled for this CD the day before the recording sessions took place! The Concerto is unusual in being in two movements, the second of which is a set of variations which serves the purpose of both slow movement and finale. The Fantasia Dramatica was premiered by the composer in 1893; its three movements make it almost more of a concerto than the earlier work. Both works, though using the harmonic language of the time, show real individuality in their ideas. 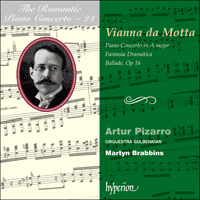 The conventional conflicts of the 19th century concerto being largely replaced by an integration of the piano with the orchestra which suits the primarily lyrical ideas (though there is much very awkward virtuosic writing which testifies to da Motta's pianistic ability). The CD is completed with the Ballade for solo piano of 1905. The composer regarded this as his greatest piano work. José Vianna da Motta was one of the greatest pianists of his time, as well as a conductor, a teacher of international renown, a worthy musicologist and an important composer in the history of Portuguese music. Born in São Tomé in Africa in 1868, he left for Lisbon while still a child and soon began his music studies at the National Conservatory of Music. Also in Lisbon he received piano lessons from Joaquim de Azevedo Madeira. The titular King of Portugal, Fernando II of Saxe-Coburg-Gotha, and the Countess of Edla, interested in guiding his precocious talent, awarded the young Vianna da Motta a scholarship in 1882 to study in Berlin at the Scharwenka Conservatory. Later, while a lodger at Frau Margarethe Lemke’s, he felt that his tuition at the Conservatory was unproductive, and he decided instead to pursue his studies with Professor Karl Schäffer. He rapidly earned an enviable reputation as a pianist in Berlin, frequently performing with that city’s Philharmonic Orchestra, as well as becoming a highly sought-after pedagogue, musicologist and conductor. In the summer of 1885 he went to Weimar to attend the masterclasses of Franz Liszt, an experience he would treasure for the rest of his life. Two years later he studied with Hans von Bülow, who not only had an important musical effect on the young man but also affected him deeply in a philosophical sense. Through this contact with Bülow, Vianna da Motta became a highly regarded interpreter and scholar of Beethoven. Vianna da Motta remained in Berlin until the outbreak of war in 1914, giving frequent concerts in Europe and the Americas, appearing with such artists as Sarasate, Ysaÿe (with whom he performed in Carnegie Hall), Casals, Amalie Joachim and Busoni. Busoni dedicated a Mozart concerto cadenza to him as well as his transcriptions of Bach chorale preludes, and Vianna da Motta gave the premiere of Busoni’s transcription of Bach’s Toccata, Adagio and Fugue in C major. Albéniz also dedicated his piano work La Vega to him. With Busoni, Vianna da Motta embarked on a new complete edition of Liszt’s works for Breitkopf & Härtel. The two artists also collaborated on projects commemorating Beethoven and in Berlin performed Liszt’s transcription of Beethoven’s Ninth Symphony for two pianos. After the outbreak of the First World War Vianna da Motta left Germany and accepted a position of professor of the ‘Classe de Virtuosité’ at the Geneva Conservatory, a post that had been held until his death by Bernhard Stavenhagen, another pupil of Liszt. He remained in Geneva, still touring as a concert pianist, until 1917, when he returned to Portugal, where he was resident for the rest of his life. Upon his return to Lisbon, Vianna da Motta became Chief Conductor of the Lisbon Symphony Orchestra. In this capacity he gave the Portuguese premieres of works such as Brahms’s Third Symphony, Saint-Saëns’s Phaéton, Berlioz’s Roméo et Juliette and Debussy’s Prélude à l’après-midi d’un faune. In 1919 Vianna da Motta accepted the position of Director at the National Conservatory of Music in Lisbon and immediately undertook important reforms of the curriculum, including the opposition to the culture of Italian opera, which has dominated Portuguese musical culture during the eighteenth and nineteenth centuries, and the introduction of instrumental repertoire. Alongside these endeavours, Vianna da Motta established the Lisbon Concert Society in 1917 in order to create a new ‘taste’ for music among the Portuguese public. After his return to Portugal, Vianna da Motta’s career gradually restricted itself to his homeland as his duties took more of his time and energy. He still left a small but important recorded legacy including works of Busoni, Liszt and Chopin, as well as his own music; he also made some piano rolls for the Welte-Mignon firm. These few performances, along with an amazing recorded performance of Liszt’s Totentanz conducted by Pedro de Freitas Branco in what proved to be Vianna da Motta’s final concert appearance, give us a clear view of Vianna da Motta the pianist, the musician and the thinker. As a composer, Vianna da Motta left a considerable output. His best-known work, the Symphony ‘To the Fatherland’ (‘À Pátria’) was composed in 1895 and first performed in Porto two years later. Each of its four movements is a musical reflection of poems by Luis de Camões. His Ballada Op 16—composed in 1905 and based on two popular Portuguese songs, ‘Tricana da Aldeia’ and an ‘Ave Maria’—is undoubtedly his most mature piano work. The first song is treated in variation form and the second serves as a peaceful coda to a dramatic and virtuosic work. This work is similar in form to Grieg’s Ballade in G minor, and it is interesting to note that in his book Meister des Klaviers Walter Niemann referred to Vianna da Motta as ‘the Portuguese Grieg’. In the earlier works for piano and orchestra we can best observe the fusion of temperamental and cultural differences. In all his captivating artistic sensibility, Vianna da Motta never ceased to be both Latin and Portuguese. He was an introverted character, extremely sensitive and serious but not without humour and vivacity; studious and a perfectionist, he had an intellectual and creative affinity with the German cultural milieu. His importance as a composer is mainly due to his assimilation of an aesthetic and technique influenced by Liszt and Wagner, as well as by Russian nationalism. There are also perhaps occasional hints of Schumann and Mendelssohn. In the Concerto in A major, composed between 1886 and 1887 and dedicated to his teacher Karl Schäffer, we see a very young composer preoccupied not only with the technical aspects of composition but also with creating a virtuosic vehicle for the soloist. At this early stage as a composer we can already hear the unmistakeable ‘voice’ of Vianna da Motta: there is sometimes an awkward co-existence of styles, with the folk influences of his homeland infiltrating an otherwise Teutonic composition. The piano’s role is technically demanding and unforgiving, but musically rewarding. Again Vianna da Motta’s obvious fondness for variation form is apparent in the second movement. This work was given its world premiere in Portugal on the day before this recording was made, by the same ‘cast’. The Fantasia Dramática for piano and orchestra was dedicated to the Countess of Edla as an inspired form of thanks for all the support and attention given to Vianna da Motta during his musical development. It was composed in 1893 and first performed the same year in Lisbon at the Salão da Trindade with the composer as soloist and the Orchestra of the 24 of June conducted by Victor Hussla. As far as is known this was the work’s only performance until the same concert that saw the premiere of the A major Piano Concerto, just prior to this recording, where it was likewise performed by the same musicians as on this recording. This is a work of greater maturity and lyricism, where the composer is more comfortable with the physical requirements of the orchestra and the piano although the virtuosic demands of both are still deceptively high. There is also a better integration of the musical discourse, with an adaptation of the fluid structural forms of Liszt’s concertos. The three sections of this one-movement work are clearly definable and their interrelationships are equally transparent. This work already gives a hint of things to come, such as Vianna da Motta’s Symphony, his Invocação do poema de Luis de Camões Os Lusiadas (‘Invocation of the Lusiads’), his later works for solo piano, and his memorable collection of Lieder. Vianna da Motta died in Lisbon in 1948. His music lives on in the spirit of Portuguese nationalism: its importance cannot be better illustrated than when his folk-dance Chlula was broadcast repeatedly on Portuguese State Television (RTP) during the Revolution of 1974, when Portugal became a Democratic Republic. It was this work that best illustrated the momentous occasion of the resurgence of Portuguese national pride. Chef d’orchestre, professeur de renommée internationale, musicologue remarquable et compositeur clé de l’histoire de la musique portugaise, José Vianna da Motta fut l’un des plus grands pianistes de son temps. Né à São Tomé en 1868, il était encore enfant lorsqu’il gagna Lisbonne, où il entreprit bientôt d’étudier la musique au Conservatoire national, tout en recevant des leçons de piano de Joaquim de Azevedo Madeira. En 1882, soucieux de guider ce talent précoce, le roi nominal du Portugal, Fernando II de Saxe-Cobourg-Gotha, et la comtesse d’Edla lui accordèrent une bourse pour qu’il allât étudier à Berlin, au Conservatoire Scharwenka. Mais, alors qu’il était pensionnaire chez Frau Margarethe Lemke, Vianna da Motta sentit que ses cours au Conservatoire étaient stériles et résolut de poursuivre ses études auprès du professeur Karl Schäffer. À Berlin, il se conquit rapidement une réputation de pianiste, jouant souvent avec l’Orchestre Philharmonique de la ville, tout en devenant un pédagogue, un musicologue et un chef d’orchestre fort prisé. En 1885, il se rendit à Weimar, en été, pour assister aux masterclasses de Franz Liszt—une expérience qu’il allait chérir toute sa vie. En 1887, il étudia avec Hans von Bülow, qui exerça sur lui une profonde influence musicale et philosophique. Ce contact avec von Bülow fit de Vianna da Motta un interprète et un spécialiste de Beethoven des plus respectés. Vianna da Motta demeura à Berlin jusqu’au début de la guerre, en 1914, donnant de fréquents concerts en Europe et dans les Amériques, aux côtés d’artistes comme Sarasate, Ysaÿe (avec qui il se produisit au Carnegie Hall), Casals, Amalie Joachim et Busoni—lequel lui dédia une cadenza d’un concerto de Mozart et ses transcriptions de préludes-choral de Bach. Vianna da Motta donna, en outre, la première de la transcription busonienne de la Toccata, de l’Adagio et de la Fugue en ut majeur de Bach, et fut le dédicataire de la pièce pour piano d’Albéniz intitulée La Vega. Avec Busoni, Vianna da Motta se lança dans une nouvelle édition complète des œuvres de Liszt pour Breitkopf & Härtel. Les deux artistes collaborèrent également à des projets commémorant Beethoven, compositeur dont ils interprétèrent, à Berlin, la transcription lisztienne de la Neuvième symphonie, pour deux pianos. Après le début de la Première Guerre mondiale, Vianna da Motta quitta l’Allemagne et accepta un poste de professeur de la «classe de virtuosité» au Conservatoire de Genève—poste qu’avait tenu, jusqu’à sa mort, Bernhard Stavenhagen, un autre élève de Liszt. Sans abandonner ses tournées de concerts, Vianna da Motta demeura à Genève jusqu’en 1917, date à laquelle il rentra définitivement au Portugal. Là, devenu chef d’orchestre principal de l’Orchestre symphonique de Lisbonne, il assura les premières portugaises d’œuvres comme la Troisième symphonie de Brahms, Phaéton de Saint-Saëns, Roméo et Juliette de Berlioz et Prélude à l’après-midi d’un faune de Debussy. En 1919, il accepta le poste de directeur du Conservatoire national de musique, toujours à Lisbonne. Entreprenant d’emblée d’importantes réformes du programme d’enseignement, il s’opposa notamment à la culture de l’opéra italien, qui avait dominé la culture musicale portugaise des XVIIIe et XIXe siècles, et introduisit le répertoire instrumental—rappelons que, désireux de susciter, chez ses compatriotes, un nouveau «goût» pour la musique, il avait déjà fondé, en 1917, la Société des concerts de Lisbonne. Une fois rentré au Portugal, Vianna da Motta vit peu à peu sa carrière se restreindre à son pays, où ses fonctions lui prenaient beaucoup de temps et d’énergie. Il laissa toutefois un petit, mais essentiel, legs d’enregistrements, comprenant notamment, outre sa propre musique, des œuvres de Busoni, de Liszt et de Chopin; il réalisa également des rouleaux pour la firme Welte-Mignon. Ces quelques interprétations, ainsi qu’un époustouflant enregistrement de la Totentanz de Liszt, sous la direction de Pedro de Freitas Branco (lors de ce qui devait être la dernière apparition du concertiste), nous donnent clairement à voir le Vianna da Motta pianiste, musicien et penseur. La production du Vianna da Motta compositeur est, quant à elle, considérable. Sa pièce la plus célèbre, la Symphonie «À la patrie» («À Pátria»), composée en 1895, fut créée à Porto en 1897. Chacun de ses quatre mouvements est le reflet musical de poèmes de Luis de Camões. Composée en 1905 et fondée sur deux chansons populaires portugaises, «Tricana da Aldeia» et un «Ave Maria», sa Ballada op.16 est indéniablement son œuvre pour piano la plus aboutie. La première chanson est traitée sous forme de variation, cependant que la seconde sert de paisible coda à cette pièce dramatique et virtuose, dont la forme évoque la Ballade en sol mineur de Grieg—dans son livre Meister des Klaviers, Walter Niemann vit d’ailleurs en Vianna da Motta le «Grieg portugais». Ses premières œuvres pour piano et orchestre sont celles qui laissent le mieux transparaître la fusion des différences de tempérament et de culture. Dans sa fascinante sensibilité artistique, Vianna da Motta ne cessa jamais d’être latin et portugais. Personnage introverti, extrêmement sensible et sérieux, mais non dénué d’humour et de verve, studieux et perfectionniste, il eut une affinité intellectuelle et créatrice avec le milieu culturel allemand. Son importance, en tant que compositeur, tient surtout à son assimilation d’une esthétique et d’une technique influencées par Liszt, par Wagner, mais aussi par le nationalisme russe, le tout teinté, peut-être, d’occasionnelles nuances schumanniennes et mendelssohniennes. Composé entre 1886 et 1887, et dédié à Karl Schäffer, le Concerto en la majeur nous présente un très jeune compositeur soucieux non seulement des aspects techniques de la composition, mais de la création d’un véhicule virtuose pour le soliste. Cette pièce de jeunesse nous donne déjà à entendre la «voix» si caractéristique de Vianna da Motta, avec parfois une délicate coexistence de styles, où les influences populaires de sa patrie infiltrent une composition par ailleurs teutonne. Le rôle du piano est techniquement exigeant et impitoyable, mais musicalement gratifiant. Une fois encore, l’évidente tendresse du compositeur pour la variation se manifeste dans le second mouvement. La première mondiale de cette œuvre fut donnée au Portugal, la veille du présent enregistrement, par les mêmes interprètes. La Fantasia Dramática pour piano et orchestre fut dédiée à la comtesse d’Edla, en remerciements inspirés pour tout le soutien et toute l’attention accordés à Vianna da Motta au cours de son évolution musicale. Composée en 1893, elle fut créée la même année, à Lisbonne, au Salão da Trindade, avec, comme soliste, le compositeur, accompagné par l’Orchestre du 24 juin, sous la direction de Victor Hussla. Pour autant que nous sachions, cette œuvre ne fut plus jamais donnée jusqu’à ce même concert qui vit la première mondiale susmentionnée. Dans cette œuvre, d’une maturité et d’un lyrisme accrus, le compositeur se montre plus à l’aise avec les exigences physiques de l’orchestre et du piano, bien que la virtuosité requise soit encore apparemment élevée. Le discours musical est, lui aussi, mieux intégré, avec une adaptation des formes structurelles fluides des concertos de Liszt. Les trois sections de cette pièce en un mouvement sont aisément définissables, de même que leurs relations, tout aussi transparentes. La Fantasia Dramática laisse déjà entrevoir des œuvres comme la Symphonie, l’Invocação do poema de Luis de Camões Os Lusiadas, les pièces tardives pour piano solo et la mémorable collection de Lieder du compositeur. La musique de Vianna da Motta, mort à Lisbonne en 1948, survit dans l’âme du nationalisme portugais, comme l’attestent les multiples diffusions de sa danse populaire Chlula, à la Télévision nationale portugaise (RTP), lors de la Révolution de 1974, qui vit le Portugal accéder à la démocratie. Cette œuvre fut celle qui symbolisa le mieux cette mémorable résurgence de la fierté nationale portugaise. José Vianna da Motta war einer der größten Pianisten seiner Epoche, außerdem Dirigent, Lehrer von internationalem Rang, verdienstvoller Musikwissenschaftler und einer der bedeutenden Komponisten in der Geschichte der porugiesischen Musik. Geboren 1868 im afrikanischen São Tomé, siedelte er noch als Kind nach Lissabon um und nahm bald seine Musikausbildung am Conservatório Nacional de Música auf. In Lissabon erhielt er auch Klavierunterricht von Joaquim de Azevedo Madeira. Der portugiesische Regent Ferdinand II. von Sachsen-Coburg-Gotha und die Gräfin von Edla, die diese frühe Begabung fördern wollten, gewährten dem jungen Vianna da Motta 1882 ein Stipendium zum Studium am Berliner Scharwenka-Konservatorium. Später, als Untermieter bei Frau Margarethe Lemke, empfand er den Unterricht am Konservatorium als unproduktiv und beschloß, seine Ausbildung bei Professor Karl Schäffer fortzusetzen. Er erwarb sich in Berlin rasch einen beneidenswerten Ruf als Pianist und trat häufig mit dem philharmonischen Orchester der Stadt auf; daneben wurde er zum gefragten Pädagogen, Musikforscher und Dirigenten. Im Sommer 1885 ging er nach Weimar, um die Meisterklassen von Franz Liszt zu besuchen, eine Erfahrung, die er sein ganzes Leben lang in hohen Ehren halten sollte. Zwei Jahre später studierte er bei Hans von Bülow, der nicht nur musikalisch, sondern auch philosophisch tiefen Einfluß auf den jungen Mann ausübte. Durch seine Verbindung zu Bülow wurde Vianna da Motta ein hochangesehener Beethoven-Interpret und -Kenner. Vianna da Motta blieb bis zum Kriegsausbruch 1914 in Berlin und gab zahlreiche Konzerte in Europa sowie Nord- und Südamerika, wo er mit Künstlern wie Sarasate, Ysaÿe (in der Carnegie Hall), Casals, Amalie Joachim und Busoni auftrat. Busoni widmete ihm seine Kadenz für ein Mozart-Konzert sowie seine Transkriptionen Bach’scher Choralvorspiele, und Vianna da Motta besorgte die Uraufführung von Busonis Bearbeitung von Bachs Toccata, Adagio und Fuge in C-Dur. Albéniz widmete ihm seine Klavierkomposition La Vega. Zusammen mit Busoni machte sich Vianna da Motta für Breitkopf & Härtel an die Herausgabe einer vollständigen neuen Liszt-Edition. Die beiden Künstler arbeiteten außerdem an Projekten zum Gedenken an Beethoven zusammen und führten in Berlin Liszts Transkription von Beethovens Neunter Sinfonie für zwei Klaviere auf. Nach Ausbruch des Ersten Weltkriegs verließ Vianna da Motta Deutschland und nahm die Professur der „Classe de Virtuosité“ am Genfer Konservatorium an—diesen Posten hatte Bernhard Stavenhagen, ein weiterer Liszt-Schüler, bis zu seinem Tod innegehabt. Vianna da Motta blieb (bis auf weitere Tourneen als Konzertpianist) bis 1917 in Genf, um dann nach Portugal zurückzukehren, wo er den Rest seines Lebens ansässig war. Bei seiner Rückkehr nach Lissabon wurde er zum Chefdirigenten des Lissabonner Sinfonieorchesters berufen. In dieser Eigenschaft gab er die portgiesische Erstaufführung von Werken wie Brahms’ Dritter Sinfonie, Saint-Saëns’ Phaéton, Berlioz’ Roméo et Juliette und Debussys Prélude à l’après-midi d’un faune. Im Jahre 1919 wurde Vianna da Motta zum Direktor des Conservatório Nacional de Música in Lissabon berufen und nahm sofort wesentliche Reformen am Lehrplan in Angriff, um beispielsweise der Kultur der italienischen Oper entgegenzuwirken, die das portugiesische Musikleben des achtzehnten und neunzehnten Jahrhunderts beherrscht hatte, und die Einführung eines Instrumentalrepertoires zu betreiben. Daneben gründete Vianna da Motta 1917 den Lissabonner Konzertverein, um dem portugiesischen Publikum neue Lust auf Musik zu machen. Nach seiner Rückkehr nach Portugal beschränkte sich Vianna da Mottas Schaffen immer mehr auf seine Heimat, da seine dortigen Pflichten einen größeren Teil seiner Zeit und Energie beanspruchten. Immerhin hinterließ er eine kleine Anzahl bedeutender Aufnahmen auf Tonträger, darunter Werke von Busoni, Liszt und Chopin sowie seine eigenen Kompositionen; überdies bespielte er für die Firma Welte-Mignon mehrere Klavierrollen. Diese wenigen Darbietungen sowie die Aufzeichnung einer erstaunlichen Aufführung von Liszts Totentanz unter der Leitung von Pedro de Freitas Branco (die sich als Vianna da Mottas letztes Konzert erweisen sollte) verschaffen uns ein klares Bild von Vianna da Motta, dem Pianisten, Musiker und Denker. Als Komponist hat Vianna da Motta ein umfangreiches Oeuvre hinterlassen. Sein bekanntestes Werk, die Sinfonie „an das Vaterland“ („À Pátria“), entstand 1895 und wurde zwei Jahre später in Porto uraufgeführt. Die vier Sätze sind musikalische Umsetzungen von Gedichten von Luis de Camões. Die Ballada op. 16—1905 auf der Grundlage zweier beliebter portugiesischer Gesangsstücke komponiert, dem Lied „Tricana da Aldeia“ und einer Version des „Ave Maria“—ist zweifellos sein reifstes Werk für Klavier. Das Lied wird in Variationsform verarbeitet und das „Ave Maria“ dient als friedliche Coda einer dramatischen und virtuosen Komposition. Die Ballada ähnelt von der Form her Griegs Ballade in g-Moll, und es mag von Interesse sein, daß Walter Niemann in seinem Buch Meister des Klaviers Vianna da Motta als „portugiesischen Grieg“ bezeichnet. An den früheren Werken für Klavier und Orchester können wir die Verschmelzung unterschiedlicher Temperamente und Kulturen am besten beobachten. Bei aller einnehmenden künstlerischen Sensibilität hörte Vianna da Motta nie auf, Südländer und insbesondere Portugiese zu sein. Er war introvertiert, ausgesprochen sensibel und ernsthaft, aber auch humorvoll und lebhaft; als Gelehrter und Perfektionist besaß er eine intellektuelle und kreative Affinität zum kulturellen Milieu Deutschlands. Seine Bedeutung als Komponist verdankt sich im wesentlichen dem Umstand, daß er sich eine Ästhetik und Kompositionstechnik angeeignet hatte, die ebenso von Liszt und Wagner wie von der nationalistischen russischen Schule beeinflußt war. Gelegentlich meint man auch Anklänge an Schumann und Mendelssohn festzustellen. Im Konzert in A-Dur, komponiert im Zeitraum 1886/87 und seinem Lehrer Karl Schäffer gewidmet, erkennen wir einen sehr jungen Komponisten, den nicht nur die technischen Aspekte des Tonsatzes beschäftigen, sondern auch die Schaffung eines virtuosen Mediums für den Solisten. Schon in diesem frühen Stadium seiner Komponistenlaufbahn ist die unverwechselbare „Stimme“ von Vianna da Motta zu erkennen: Manchmal kommt es zu einer unbehaglichen Koexistenz verschiedener Stile, wenn sich die Einflüsse volkstümlicher Musik aus seiner Heimat in eine ansonsten teutonische Komposition einschleichen. Die Rolle des Klaviers ist technisch anspruchsvoll und unerbittlich schwierig, aber musikalisch lohnend. Im zweiten Satz macht sich wiederum Vianna da Mottas Vorliebe für die Variationsform bemerkbar. Die Uraufführung des Werks fand in Portugal statt, und zwar am Tag, ehe mit der gleichen Besetzung diese Einspielung vorgenommen wurde. Die Fantasia Dramática für Klavier und Orchester ist der Gräfin von Edla gewidmet, als schöpferische Danksagung für alle Unterstützung und Aufmerksamkeit, die sie Vianna da Motta während seiner Musikausbildung hatte zukommen lassen. Die 1893 entstandene Fantasie wurde im selben Jahr im Lissabonner Salão da Trindade uraufgeführt, mit dem Komponisten am Klavier und dem Orchester des 24. Juni unter der Leitung von Victor Hussla. Soweit bekannt, war dies die einzige Aufführung des Werks bis zu jener Veranstaltung, bei der das Klavierkonzert uraufgeführt wurde; außerdem wurde es ebenfalls am Tag danach von den gleichen Kräften auf Tonträger eingespielt. Die Fantasia ist reifer und lyrischer und der Komponist weiß besser mit den physischen Erfordernissen des Orchesters und des Klaviers umzugehen, was jedoch nicht heißt, daß die virtuosen Ansprüche an beide geringer wären. Auch ist der musikalische Diskurs besser integriert, wobei die fließenden Strukturen von Liszts Konzerten als Vorbild dienen. Die drei Abschnitte des einsätzigen Werks sind klar unterscheidbar, und ebenso eindeutig kann man ihre Beziehungen zueinander erkennen. Diese Komposition gewährt bereits einen Blick in die Zukunft und weist unter anderem voraus auf Vianna da Mottas Sinfonie, seine Invocação do poema de Luis de Camões Os Lusiadas, seine späteren Klavierwerke und seine denkwürdige Sammlung von Liedern. José Vianna da Motta starb 1948 in Lissabon. Seine Musik lebt im Geiste des portugiesischen Nationalismus fort: Seine Bedeutung läßt sich nicht besser illustrieren als damit, daß sein Volkstanz Chlula während der Revolution von 1974, als Portugal zur demokratischen Republik wurde, mehrmals vom Portugiesischen Staatsfernsehen (RTP) ausgestrahlt wurde. Dieses Werk veranschaulichte am besten die besondere Bedeutung des Anlasses—das Wiedererstehen des portugiesischen Nationalstolzes. José Vianna da Motta foi um dos grandes pianistas do seu tempo, bem como maestro, professor de renome internacional, conceituado musicólogo e um importante compositor na história da música portuguesa. Nascido em São Tomé e Príncipe em 1868, partiu para Lisboa ainda criança e iniciou os seus estudos musicais do Conservatório Nacional de Música. Ainda em Lisboa, recebeu lições de piano de Joaquim de Azevedo Madeira. O rei de Portugal, D. Fernando II de Saxe-Coburgo-Gota, e a condessa de Edla, interessados na orientação do seu precioso talento, concederam ao jovem Vianna da Motta uma bolsa, em 1882, para estudar no Conservatório Scharwenka de Berlim. Mais tarde, sendo hóspede de Frau Margarethe Lemke, sentiu que o seu ensino no Conservatório não era produtivo, e resolveu prosseguir os estudos com o professor Karl Schäffer. Depressa granjeou uma reputação invejável como pianista em Berlim, actuando frequentemente com a Orquestra Filarmónica da cidade, e tornando-se igualmente um pedagogo, musicólogo e maestro muito procurado. No Verão de 1885, foi a Weimar para assistir às lições de Franz Liszt, uma experiência que iria considerar de grande valor para o resto da vida. Dois anos mais tarde, estudou com Hans von Bülow, o qual teve não só um importante efeito musical no jovem como também o afectou profundamente no sentido filosófico. Através do seu contacto com Bülow, Vianna da Motta tornou-se um intérprete e estudioso de Beethoven altamente conceituado. Vianna da Motta permaneceu em Berlim até à eclosão da guerra de 1914, dando frequentes concertos na Europa e nas Américas, apresentando-se com artistas como Sarasate, Ysaÿe (com quem actuou no Carnegie Hall), Casals, Amalie Joachim e Busoni. Busoni dedicou-lhe uma cadenza de concerto de Mozart bem como as suas transcrições dos prelúdios corais de Bach, e Vianna da Motta fez a estreia da transcrição da Tocata, Adágio e Fuga em Dó maior de Bach feita por Busoni. Albéniz também lhe dedicou a sua obra para piano La Vega. Com Busoni, Vianna da Motta iniciou uma nova edição completa das obras de Liszt para a Breitkopf & Härtel. Os dois artistas colaboraram também em projectos de comemoração de Beethoven e apresentaram em Berlim a transcrição de Liszt da Nona Sinfonia de Beethoven para dois pianos. Após a eclosão da Primeira Guerra Mundial, Vianna da Motta abandonou a Alemanha e aceitou um cargo de professor da ‘Classe de Virtuosité’ no Conservatório de Genebra, um lugar que pertencera a Bernhard Stavenhagen, outro discípulo de Liszt, até à sua morte. Permaneceu em Genebra, embora fazendo digressões como pianista de concerto, até 1917, quando regressou a Portugal, onde residiu até ao fim da vida. Após o seu regresso a Lisboa, Vianna da Motta tornou-se Maestro Director da Orquestra Sinfónica de Lisboa. Nesta qualidade fez estreias em Portugal de obras como a Terceira Sinfonia de Brahms, o Phaéton de Saint-Saëns, Roméo et Juliette de Berlioz e o Prélude à l’après-midi d’un faune de Debussy. Em 1919 Vianna da Motta aceitou o cargo de Director do Conservatório Nacional de Música em Lisboa, e logo efectuou importantes reformas no currículo, incluindo a oposição à cultura da ópera italiana, que dominara a cultura musical portuguesa ao longo dos séculos XVIII e XIX, e a introdução de repertório instrumental. Concomitantemente com estas diligências, Vianna da Motta criou a Sociedade de Concertos de Lisboa em 1917, a fim de criar um novo ‘gosto’ pela música entre o público português. Depois do seu regresso a Portugal, a carreira de Vianna da Motta foi ficando gradualmente restringida ao seu país, à medida que as suas ocupações lhe tomavam mais tempo e energia. Deixou ainda assim um importante legado gravado incluindo obras de Busoni, Liszt e Chopin, bem como da sua própria música; fez também alguns registos de piano para a firma Welte-Mignon. Estas poucas actuações, juntamente com uma espantosa interpretação gravada da Totentanz de Liszt, com direcção de Pedro de Freitas Branco, no que viria a ser a última apresentação de Vianna da Motta em concerto, dão-nos uma visão clara de Vianna da Motta como pianista, como músico e como pensador. Como compositor, Vianna da Motta deixou uma produção considerável. A sua obra mais conhecida, a Sinfonia ‘À Pátria’, foi composta em 1895 e executada pela primeira vez no Porto dois anos mais tarde. Cada um dos quatro movimentos é um reflexo de poemas de Luís de Camões. A sua Ballada Op 16—composta em 1905 e baseada em duas canções populares portuguesas, ‘Tricana da Aldeia’ e uma ‘Avé Maria’—é sem dúvida o seu trabalho mais maduro para piano. A primeira canção é tratada sob a forma de variação e a segunda serve de coda tranquila para uma obra dramática e virtuosa. Esta obra é semelhante na forma à Ballade em Sol menor de Grieg, e é interessante notar que no seu livro Meister des Klaviers Walter Niemann se refere a Vianna da Motta como ‘o Grieg português’. Nos primeiros trabalhos para piano e orquestra podemos observar melhor a fusão de diferenças temperamentais e culturais. Em toda a sua cativante sensibilidade artística, Vianna da Motta nunca deixou de ser tão latino como português. Tinha um carácter introvertido, extremamente sensível e sério, mas não isento de humor e vivacidade; estudioso e perfeccionista, tinha uma afinidade intelectual e criativa com o meio cultural alemão. A sua importância como compositor deve-se sobretudo à assimilação de uma estética e de uma técnica influenciada por Liszt e Wagner, bem como pelo nacionalismo russo. Há talvez também alusões ocasionais a Schumann e Mendelssohn. No Concerto em Lá maior, composto entre 1886 e 1887 e dedicado ao seu professor Karl Schäffer, vemos um compositor muito jovem preocupado não só com os aspectos técnicos da composição mas também com a criação de um veículo de virtuosidade para o solista. Nesta fase precoce como compositor, já podemos escutar a ‘voz’ inconfundível de Vianna da Motta: há por vezes uma coexistência embaraçosa de estilos, com as influências populares da sua pátria infiltradas numa composição de outro modo teutónica. O papel do piano é tecnicamente exigente e implacável, mas musicalmente compensador. Mais uma vez, a óbvia inclinação de Vianna da Motta para a forma da variação é evidente no segundo movimento. Esta obra teve a sua estreia mundial em Portugal na véspera da realização desta gravação, com os mesmos intérpretes. A Fantasia Dramática para piano e orquestra foi dedicada à condessa de Edla como forma inspirada de agradecimento por todo o apoio e atenção prestados a Vianna da Motta durante o seu desenvolvimento musical. Foi composta em 1893 e apresentada no mesmo ano em Lisboa, no Salão da Trindade, com o compositor como solista e a Orquestra do 24 de Junho dirigida por Victor Hussla. Tanto quanto se sabe foi esta a única apresentação da obra até ao concerto em que foi estreado o Concerto para Piano, imediatamente antes desta gravação, em que foi interpretada pelos mesmos músicos desta gravação. Trata-se de uma obra de grande maturidade e lirismo, em que o compositor está mais à vontade com os requisitos físicos da orquestra e do piano, embora as exigências virtuosísticas de ambos sejam ainda ilusoriamente altas. Há também uma melhor integração do discurso musical, com uma adaptação das formas estruturais fluidas dos concertos de Liszt. As três partes desta obra num só movimento são claramente definidas e as suas inter-relações são igualmente transparentes. Esta obra já deixa indícios de coisas futuras, como a sinfonia de Vianna da Motta, a sua Invocação do poema de Luis de Camões Os Lusiadas, o seu último trabalho para piano solo, e a sua memorável colecção de Lieder. Vianna da Motta morreu em Lisboa em 1948. A sua música permanece no espírito do nacionalismo luso: a sua importância não pode ficar melhor ilustrada do que quando a sua dança popular Chlula foi transmitida repetidamente pela Rádio Televisão Portuguesa (RTP) durante a revolução de 1974, quando Portugal se tornou uma República Democrática. Foi esta obra que melhor ilustrou a importante ocasião da ressurgência do orgulho nacional português.